Like me, you might find inspiration in some of the stories shared at the annual celebration of the Housing Development Consortium, an umbrella group of nearly 140 governments, nonprofits and businesses. Heroin addiction drove Brandon Getz to Seattle. Job Pangilinan came looking for a more secure and meaningful life. Megan Espinoza wanted to use the skills she’d acquired working in Uganda. They all found what they needed here, helping people get and keep a roof over their heads. Whatever cause you embrace, or trial you are dealing with, you might find inspiration in the three very different stories they told Tuesday at the annual celebration of the Housing Development Consortium, an umbrella group of nearly 140 governments, nonprofits and businesses that play a role in King County housing. 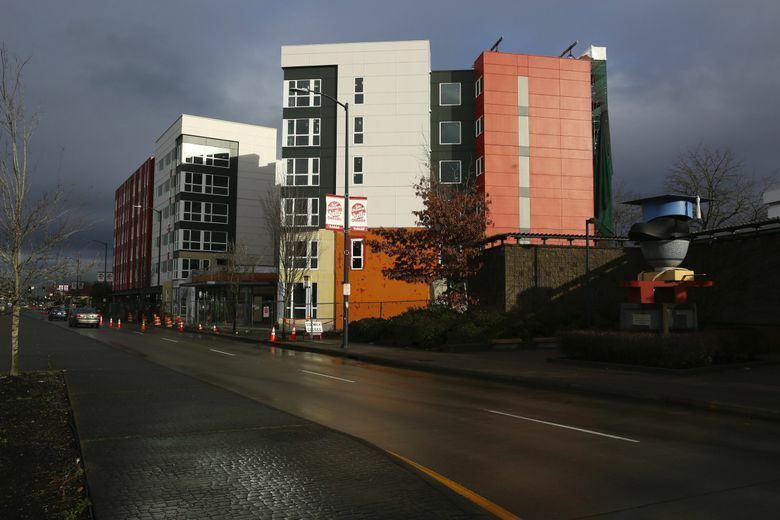 Providing affordable housing is an upstream swim against Seattle’s swift-moving economy, and the best way forward is often a matter for debate. Still, each speaker found a reason to keep swimming. He found a couch to crash on for a little money, and he enrolled at Seattle Central College and earned an associate of arts degree. A friend got him to apply for a job at Plymouth, and he was hired, despite having no qualifications, except what he calls “years of field work” that allow him to understand and empathize with the people he helps. Working with them is his reward. Job Pangilinan works for the Seattle Housing Authority in its housing-choice voucher program. He was raised in the Philippines and became an engineer, but his father was his hero, a lawyer who fought against corruption. Pangilinan went to law school, but his father died just as he graduated. Pangilinan practiced law but felt lost without his father’s guidance. When another corruption fighter was killed, Pangilinan had to decide “whether I was willing to be a dead hero.” He chose to move to the United States. “The first year in the country didn’t go as I’d planned,” he said. Despite his degrees, he wound up doing a series of odd jobs. He was cleaning the lavatory of an airplane when a manager asked to speak with him. Pangilinan had been emailing suggestions for improvements to managers but hearing nothing back. He was expecting criticism, but instead the manager praised him and urged him to keep improving the job and himself. Feeling listened to and supported spurred Pangilinan to aspire to work that would make him feel that, like his father, he was benefiting the community. “I found my passion in affordable housing,” he said. Megan Espinoza is on the architectural staff of SMR Architects, grew up outside Portland and designs affordable housing in King County. At 11, Espinoza decided she would develop housing in Africa. “I knew someone who had just spent six months in West Africa, and the stories he told were inspiring.” After graduating from the University of Oregon, she spent two years creating housing in Uganda. She came back to the United States with skills she wanted to apply in this country. She’s been doing that for the past seven years in Seattle and King County, but Espinoza said she is sometimes discouraged. The number of people who need housing remains high despite all the work done to change that. She said she just finished a building, and immediately there was a long waiting list. The size of the problem was weighing on her one day when she came home to find a man passed out in front of her house. She and some other people were able to get help for him. Doing that moved her focus from the numbers to the individuals being helped. She said it reminded her that “my small role combined with all of you folks” does make a difference. There is no shortage of difficult problems. But fortunately there are people who know that what they add to the struggle matters.